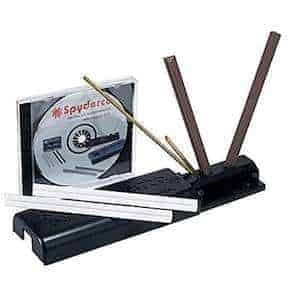 The Spyderco, Tri-Angle Sharpmaker is a very popular manual knife sharpener, with extremely high consumer reviews. We were keen to delve deeper into what the tool has to offer. The Spyderco brand itself has been around for a number of years, and has achieved a certain amount of infamy in certain circles because of the uniqueness of their knives. Not a company to follow the crowd, their products are often ergonomic in design and to be honest, can sometimes look a little strange. This does not affect performance in any way however. By all accounts, the Tri-Angle Sharpmaker follows suit. 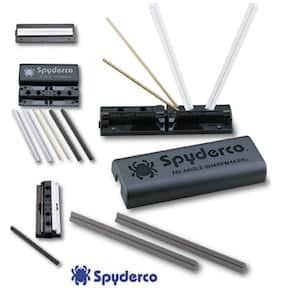 This is actually the first and most popular spyderco knife sharpener released. The tool includes 2 sets of high alumina ceramic stones. As to be expected, these are graded differently in line with the type of sharpening to be carried out. A pair of medium-grit stones (178mm x 13mm) are utilized for aggressive sharpening, with a set of fine white stones, (also 178mm x 13mm) for obtaining a professional grade finish. Keeping to the true Spyderco philosophy of experimenting with form, the stones are triangular in shape, with the flat sides used for sharpening plain edges, and the corners used for maintaining serrated edges. This Spyderco knife sharpener really is versatile. A furrow running along the length of each stone is conveniently designed so that you can sharpen pointed items such as darts, fishhooks and awls. Ease of use is cited in many of the user reviews you come across for the Tri-Angle. For a manual sharpener it really is very safe too. Included with the tool is a set of brass safety rods that protect the users hands throughout the sharpening process. Furthermore, obtaining the correct sharpening angle is made easy through the use of keyed slots and holes (die-cut into the base of the tool) that are specially fitted for the stones. These accurately set the stone’s sharpening angle at 30 or 40 degree angle, depending on the knife style being used. Not wanting to stop there, Spyderco have designed the sharpener so that it can also be used as a benchstone. By flipping the base over, a channel allows you to lay stones side by side, (flat side up). The lid then snaps over the base creating a stable handhold for sharpening. Another convenient design touch is the portability of this beast. Once you are finished, all components snap into the self-contained ABS plastic base and lid, meaning the sharpener can be easily packed away, making it ideal for traveling with. Although the Tri Angle Sharpmaker is easy to use, Spyderco have thrown in a nice and cheesy instruction DVD to teach all newbies how to operate the tool. There are also some handy vids on Youtube, one of which we have included below. Many users who buy this tool absolutely love it, with many appraising just how easy the tool is to use and the value for money that it represents. An extremely innovative manual knife sharpener with high-grade performance. Highly recommended.